Sometimes the answers are in the silence, just you lying under the endless night sky and allowing it to speak. A moment of pure perspective, and everything else falls into place. Sometimes running around the mazes in your own head leave you with no solution, hitting every dead end when all you really needed to do was breathe for a minute and realize there was never a maze in the first place. It’s okay not to have all the answers, it’s okay to let your best be good enough, to become content with the mess. After all, we are all part of something much, much bigger. There is purpose behind the chaos, and the quickest way to remember that is to look right at it. 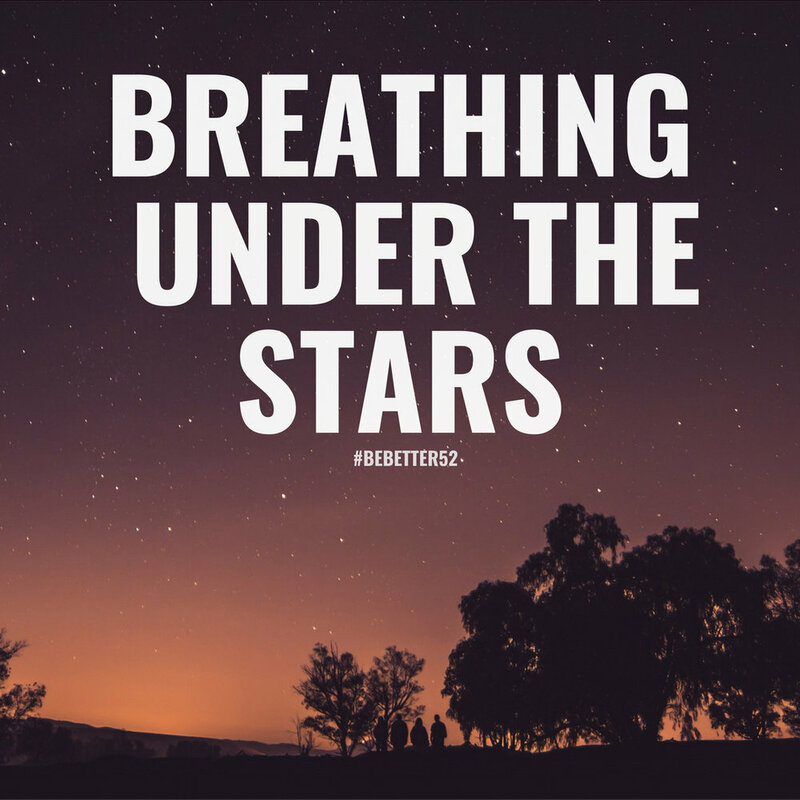 That’s why this week’s #bebetter52 challenge is to sit under the stars and just breathe. The night sky has a way of making you feel painfully insignificant yet vitally important all at the same time. It is the window to the unknown. And while that unknown can be terrifying and perplexing to think about, it can also offer abundant comfort. Like the weight of a giant blanket cascading down upon you. Each star tells a story and reminds you that you are not alone in this. When nothing makes sense that much is certain, and suddenly everything is going to be just fine. We invite you this week to go outside, lay out a blanket, and just look up. The best way to experience this powerful moment is in a state of conscious awareness, and deep breathing is essential to enter that space. Try breathing in for 8 counts, or whatever number feels most comfortable for you, and out for that same number of counts. Breathing this way relieves stress and anxiety, promotes blood flow, and makes you more in tune with your body’s physical and emotional state. This allows us to experience health benefits while simultaneously discovering what we may need in that moment, helping us to set our intention for our meditation. So focus your attention on what lies above and experience the connection you feel to the universe. It is also worth noting that many of the areas our 52ers live in have a fair amount of light pollution, meaning that far fewer stars are visible due to city lights. If you wish to take this challenge to the next level, finding a place with as little light interference as possible will greatly enhance your viewing experience. We hope this makes you feel centered and clear this week and that this week brings some much needed perspective. Happy star gazing 52ers!